Ecolodge Deseo Bamboo i Santa Catalina, Panama: Reservér nu! 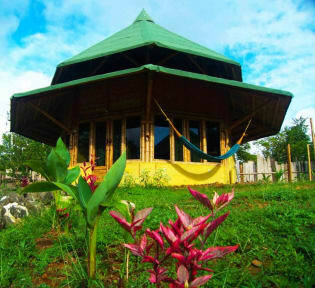 Casa Bambù – yoga & sushi bar - is the first ecologic structure in Panama. Fully built of guada, a particular species of green bambù from Colombia. Casa Bambù was founded in 2013 and has continued to grow year after year. Since its founding, Casa Bambù has diversified to include a sushi bar and yoga school. Our outdoor space is nestled in the Panamanian jungle. The main bungalow is a common space for our guests and a restaurant (sushi bar and Italian cuisine). The other 4 bungalows are common dormitory or private apartment. Yoga deck, outdoor shower, and hammocks are freely assessable by our guests. Palm trees and local flora decorate the spacious gardens of the 3,000 square meters of Casa Bambù. Guadua is a species of neotropical bambu. It is characterized by green and gnarled stems. The height can reach up to 25 meters. It is an ideal building material thank to its large diameter (it can reach up to 25 centimetres in diameter) making it the preferred bambu for building. Guadua is an earthquake-proof material. Due to these attributes, it is sometimes referred to as “vegetable steel”. Unlike modern building material, bambu does not have an adverse effect on the ecosystem. An appropriately designed bambu structure does not require petrochemical or cementing materials, all of which translates into an environmental impact of 0. •The Dormitory: Two dorms with single beds and bunk beds. Both have 6 beds each. •Deluxe bungalow: Private bungalow provided with three beds (possibility of adding the fourth). Private bathroom and kitchen. •Superior bungalow: Same as the Deluxe. •Family bungalow: the casa bambù suite. Two floors of private space, three bedrooms and panoramic terrace. For further information about our services, please consult the single voice in reservations menu, look at the photo gallery or call us if you have any doubts. Our Instagram profile is regularly updated with weekly offers and with the services proposed every day, from kitchen school to yoga lesson. Breakfast not included - 7 USD per person per day.